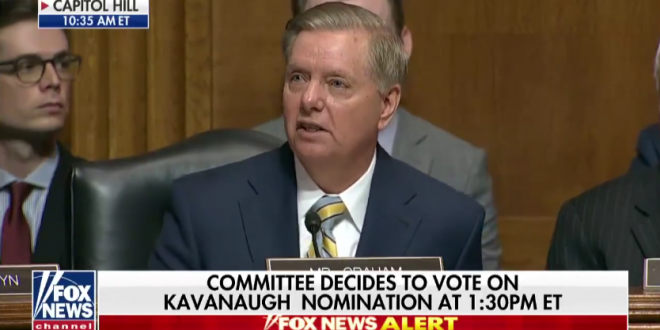 Lindsey Graham: I've Been Told I'm A Single White Male From South Carolina And Should Just Shut Up [VIDEO] - Joe.My.God. Senator Lindsey Graham says: “I know I’ve been told I’m a single white male from South Carolina so I should just shut up, but I won’t.” He is referring to Democratic Senator Mazie Hirono recent exhortation to men in political power to “shut up and step up”. Graham’s fiery speech yesterday had many questioning whether he was seeking to get President Trump’s attention somehow. Some have suggested he is auditioning to replace Attorney General Jeff Sessions, since Trump has repeatedly rubbished his top lawman.